SHS Faculty won the Dodgeball tournament that helped raise money for the Make-A-Wish Foundation! Congratulations to the Sparkman Indoor Percussion on becoming the 2019 WGI World Champions!! Congratulations to the Sparkman Dance Team on winning the Regional Championship! Colonel Stinnett of 6th Brigade presenting Sparkman with award for appreciation of outstanding JROTC program. 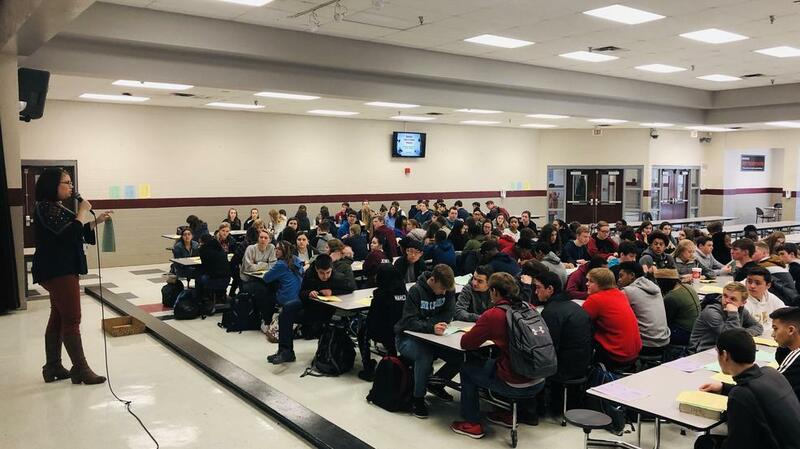 The newest, eligible members of the sophomore and junior classes met in the cafeteria to receive their applications for National Honor Society! Congratulations to our Junior Varsity Cheerleaders on their State Championship win!!! We are so excited to accept our award and be named a Blue Ribbon School! We Are Sparkman!!! WE ARE THE SPARKMAN SENATORS!!!!!! April Students of the Month who exemplify the characteristic of Integrity from the Career Tech Dept! Students in Mrs. Pates' AP Chemistry class carry out a series of experiments to prove the Combined Gas Law exists in real life examples. Senators practicing the scientific method in Mrs. Longino's Chemistry class. Congratulations to First Sergeant Walter Jones on his retirement as a JROTC instructor. Sparkman will miss you!! Congratulations to our Varsity Cheerleaders on their State Championship win!! Congratulations to Sparkman JROTC on their 1st place overall win at Grissom High School! Congratulations to Malik Tyson! Malik scored his 1000th point as a Senator on Dec.22. Congratulations to the Sparkman Marching Senators on being the 7A State Champions!!! We are proud to have the Sparkman HS Band participating in the Governor's 2019 Inaugural Parade! Click here to keep up to date with our school newsletter! Subscribe to have it sent directly to your email. How Does Sparkman High School Achieve Excellence?